Your home should be beautifully proportioned and visually appealing from the inside and outside. Sculptorhouse offers a high-quality, artist-designed home for a price so affordable that many people will be able to buy one without taking out a mortgage. By creating our kit house in the same way a sculptor creates art multiples, we significantly reduce the per-unit cost. The result is a small house of high quality and high visual appeal. Our Octagonal Living Unit is a permanent home, resistant to wind and seismic activity. Our founder has spent thirty-five years as an artist exploring ideas of housing, homelessness, and vernacular architecture. 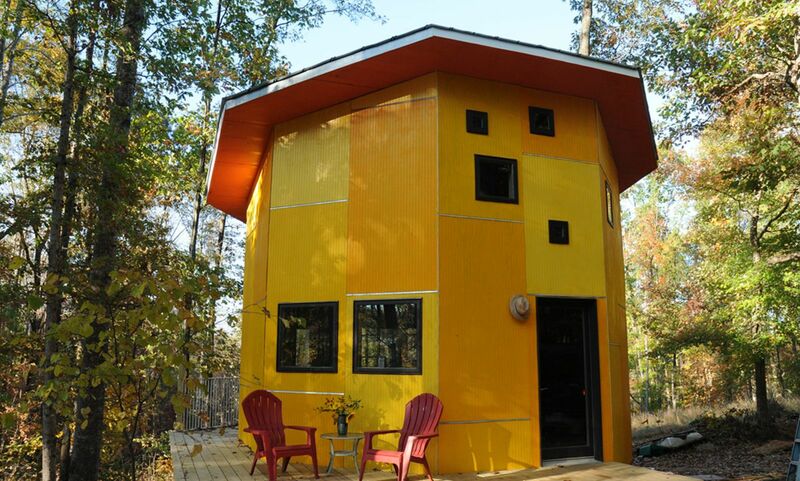 In 1981 he created The Octagonal Living Unit, a hybrid of sculpture and architecture that articulated the values of sustainable housing and the tiny house movement decades before they rose into public consciousness. That house is the basis for our prefab designs. Unlike a tiny house on wheels (THOW) The Octagonal Living Unit kit home is a legal tiny house: it is built on a permanent foundation and meets or exceeds building codes. Down in Amherst County, sculptor Craig Pleasants has created his own version of the easy-to-build, inexpensive shelter. He calls it the Octagonal Living Unit.